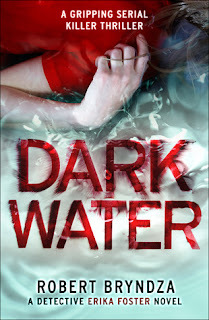 So, my DCI Erika Foster marathon came to a close with Dark Water, the third book in this crime thriller series. Each book is its own case, but back stories run throughout, so while each book can be read as a standalone, to understand the complexities of our fearless heroine I would read them in order. The reading order is The Girl in the Ice followed by The Night Stalker and then Dark Water. Once again Robert Bryndza brought a completely unputdownable read to the table and as with the first two books I devoured this one too. After the ending of The Night Stalker Erika Foster has transferred from the Murder Investigation Team at Lewisham to the CID division at Bromley. Still smarting from being overlooked for promotion Erika moved stations for pride more than anything. It is while searching for evidence in a disused flooded quarry for a huge drugs bust that Erika is once again thrust into a murder investigation. While Erika is no longer on the MIT, Erika pulls in some favours so that she can head up the investigation, one thing we have learned so far about Erika is that she sees everything through to the end. Erika was there when the body of the small child was found, it was now time for her to seek the closure for the little girl and her family. Erika soon finds herself in the media spotlight as a 1990’s cold case of a little missing girl is once again resurrected. Now with a definite body, Erika slowly tries to piece together what actually transpired on that fateful day. Thrust into an investigation where some secrets are better left buried, Erika soon finds herself treading water, but our Pitbull never gives up. No matter how deep those secrets are buried, Erika Foster always gets to the bottom of them. The trouble with uncovering the truth…the ones closest become a target. With characters from the previous two books all making an appearance despite Erika’s transfer we are once again reunited with a fantastic team of investigators. The trust and camaraderie between them is great to read about and cements them as a “family” rather than co-workers. They all have each other’s back, despite the repercussions. I was particularly pleased to see Isaac; I love this pathologist with a passion. Erika Foster is as tenacious as ever and her fearless attitude and her perseverance even when the chips are down make her a formidable opponent to any criminal. Her personal life is still on the skids, but throwing herself into her work is making inroads into her confronting her past. I only hope that as this series continues she finds some solace and maybe even a male detective to warm her bones at night. Once again Robert Bryndza delivered a layered, intriguing, suspenseful read, with many a red herring that totally led me on a merry dance. It is this layering though, the pass the parcel effect, that adds a deep connection to both characters and plot as each layer is stripped off leaving a treat for the reader. Absorbed into the world of Erika Foster once again I cannot wait for the next one.